Call them biscuits or call them cookies, these delicious morsels of crumbly, buttery and delicate sweetness are a lovely treat with your favorite beverage. Made using just a few ingredients this recipe caught my attention because it also has cornstarch – more than 3/4 of a cup. I’ve used cornstarch manly as a thickener and was curious to see how it worked here. After making the dough, roll it out on a silicone mat or parchment paper and bake. When baking is finished, sprinkle heavily with sugar and cut into 1-inch squares. Tender squares of buttery goodness. In a medium bowl, whisk together the flour, cornstarch, and salt until well blended. In mixer set on medium speed, beat the butter until creamy. Beat in the granulated sugar until light and fluffy, about 2 minutes, scraping down the sides and bottom of the bowl as necessary. On low speed, add the flour mixture in two or three additions until it forms a soft dough. Wrap the dough with plastic wrap and chill for 30 minutes. Line a baking sheet with parchment paper or silicone mat. 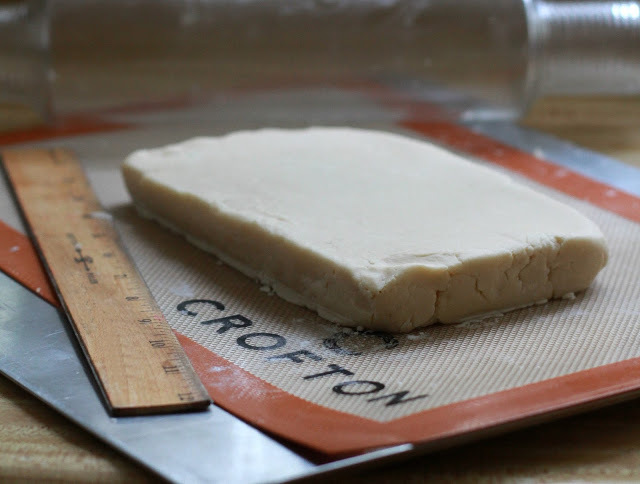 On silicone mat or on parchment paper, roll the dough out to a ¾-inch-thick rectangle, about 5 by 8 inches using a kitchen ruler to measure and press the edges square. Bake about 40 minutes or until lightly golden and firm to the touch. 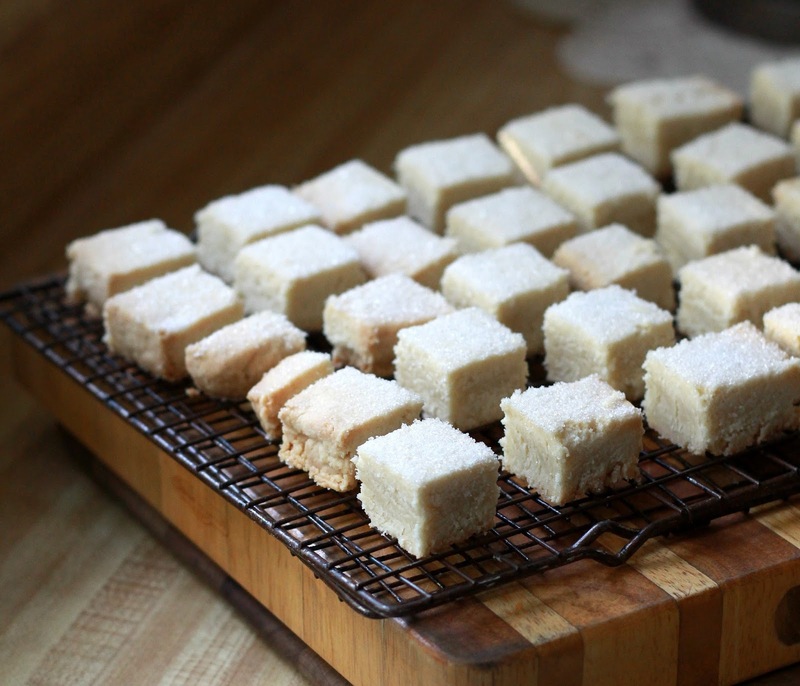 Slip the parchment paper with the shortbread onto a hard surface. 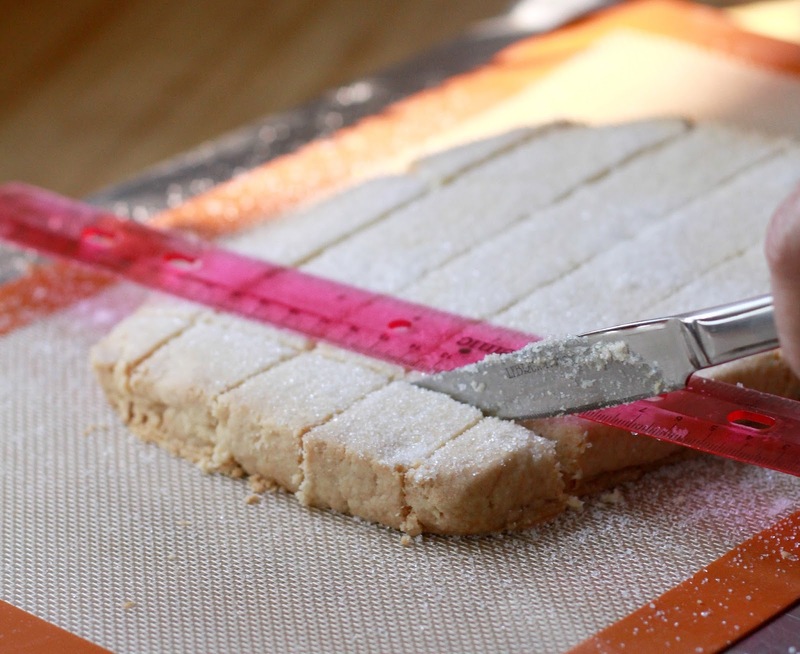 Immediately sprinkle the shortbread heavily with the baker’s sugar. While still warm, use the ruler and a sharp knife, pointed straight down, to cut the shortbread into 1- or 1 ½-inch pieces. Cool completely. 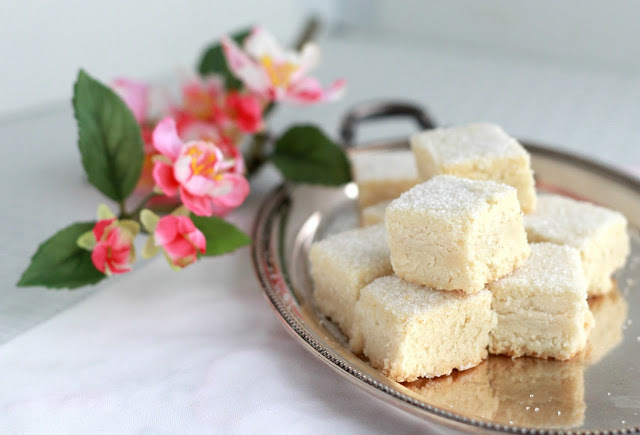 In a small bowl, stir together confectioners’ sugar, lemon juice and melted butter until smooth. 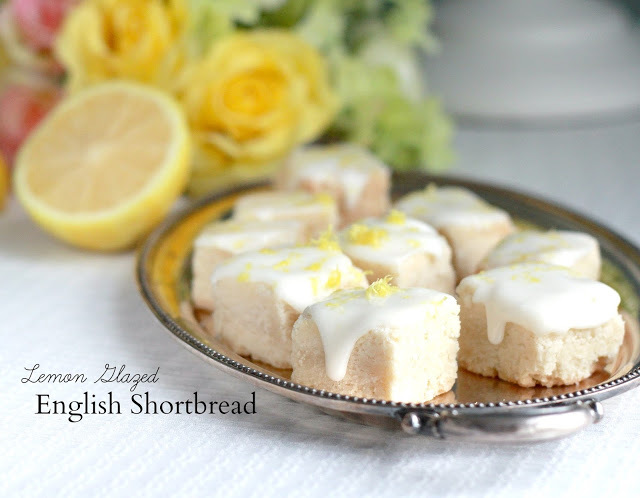 Spread on cooled shortbread; top with zest. 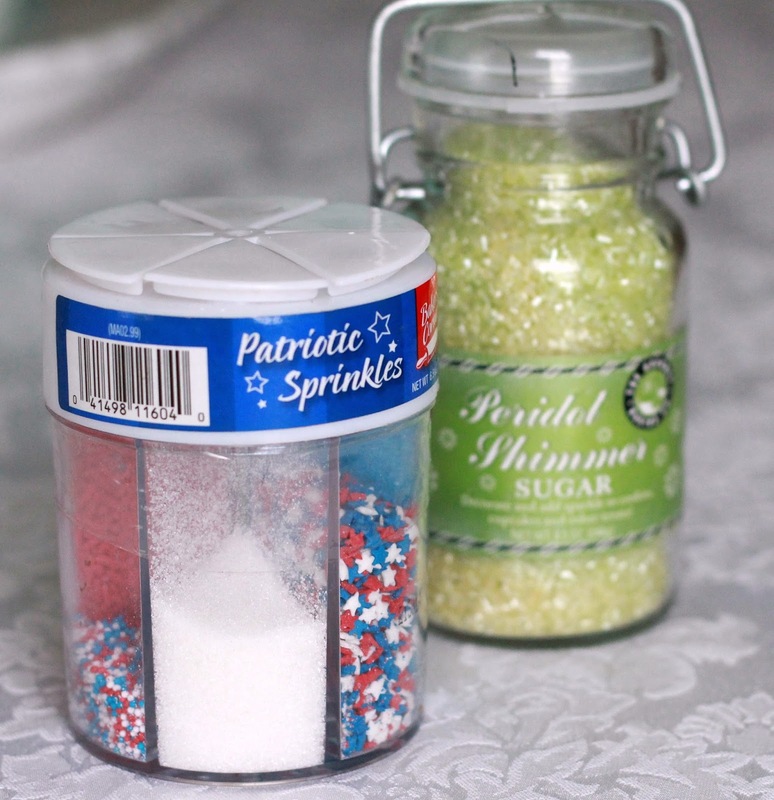 I wasn’t sure what was meant by sprinkling sugar so this is what I used. 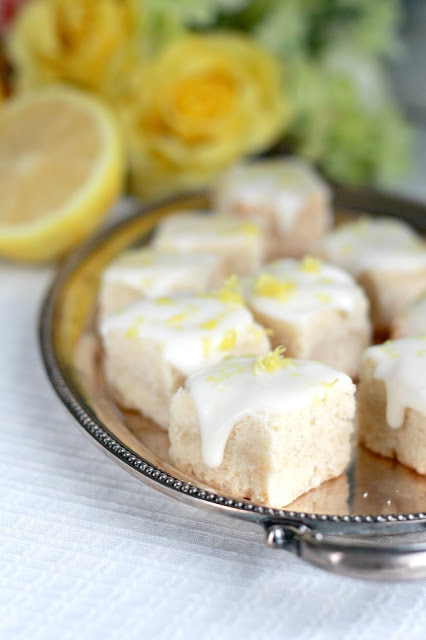 …and how I do love lemon! delish! These look delicious. I would love the lemon glaze.